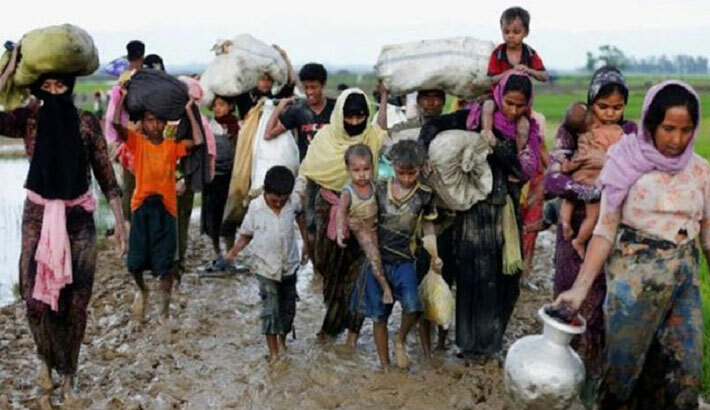 Cox’s Bazar: Rohingya people were still arriving here - the New Year bringing no end to the reports of violence and fears, which forced them to flee their homes in Myanmar, says the IOM on Monday, reports UNB. Over 2,400 Rohingyas are estimated to have arrived in Bangladesh during December 2017, with more people continuing to arrive each day as 2018 begins, according to the UN Migration Agency. A major upsurge of violence in Northern Rakhine State of Myanmar, in late August 2017 forced hundreds of thousands to flee their homes. While the number of daily arrivals has dropped significantly since the height of the influx, many of those now reaching Bangladesh say they faced additional challenges, which delayed their escape. “We couldn’t leave before now because our village was surrounded. A month ago my two sons were slaughtered. They went out fishing and they were killed,” said 50-year-old Ahmed, who was one of the first to arrive in Bangladesh in 2018 along with his two daughters, aged 20 and 18, and his 15-year-old son. He said that the family had endured weeks of fear in their village in Rathedaung, Rakhine, unable to leave their house even to collect firewood. Ahmed said that they had to pay a bribe of 150,000 kyat (c.USD $112) to the neighbours, who had been threatening them, to be allowed to leave. On arrival at the Balukhali settlement in Cox’s Bazar, Ahmed and his remaining family received medical check-ups and shelter kits of ropes, tarpaulins and basic household goods to enable them to create a place to live in the sprawling camps where 655,000 other refugees have sought safety since August. “I feel safe here,” said Ahmed’s 18-year-old daughter Raysuana, who said her mother had died years ago and her father had worked hard to bring up his family alone as a widower. As they waited at the arrival point in Balukhali, a puddle of water fell through a section of the tarpaulin roof. The unexpected noise left Ahmed badly shaken. “We continue to see a great deal of distress among Rohingya survivors arriving in Bangladesh,” said Olga Rebolledo, IOM’s mental health and psycho-social support coordinator in Cox’s Bazar. “They have faced a lot of adversity and many are in need of psycho-social support to help restore a sense of safety and further strengthen the resilience they’ve already shown,” added Rebolledo. As an indication of why some of the new arrivals have reached Bangladesh so many weeks after the main influx, out of the 17 families waiting to be led to their new shelter sites by IOM, the UN Migration Agency, on January 4, ten were declared “extremely vulnerable” cases: mostly single mothers, widows or people with disabilities, who will struggle to build their own shelters or even survive without the additional support, which will be provided by IOM and partner organisations. IOM guided the “extremely vulnerable” new arrivals to the less congested part of the site, where they will live, helping carrying their shelter kits. Once they got to the new site, help was given to construct their shelters. “The houses on both sides of ours [in Buthidaung, Rakhine] were burned. Only my house was left,” said one of the new arrivals, Asama Begum, 35 years old. Her husband died before the violence, leaving her with a new baby and a son now 15 years old. She said the teenager was attacked a few months earlier leaving him with a badly cut leg, which became infected and swollen, rendering him unable to escape when others fled their village. “I stayed because my son was sick. We were really scared to be alone in the house, but tried just to find the mental strength to stay. But then [people] started burning down the [remaining] empty houses around ours and we could not stay any longer,” said Asama.